Your client’s kitchen underwent quite a transformation. Tell us about it. We really needed to reimagine the space in order for the client to have the kitchen of their dreams. We moved walls, including exterior walls, removed soffits, changed lighting and generally updated every aspect of the kitchen. Once we had the general plan finalized, we started to focus on the specific storage solutions and design selections to make sure the kitchen functioned the way they needed it to. 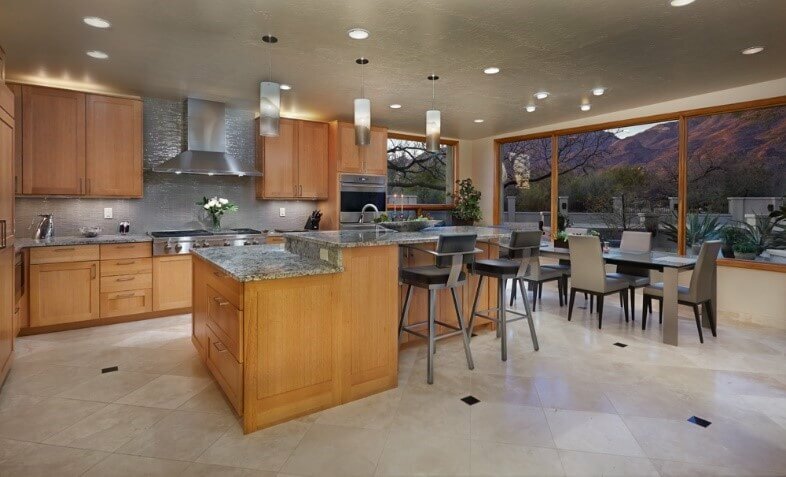 What was your client’s inspiration for the dramatic change in the kitchen? It started with the client wanting an island instead of a peninsula. But, the existing architectural floor plan was such that an island wouldn’t work. So, I worked up a plan to allow an island, which involved moving and reimagining the laundry room, key drop space, and powder room. That concept led to pushing out the breakfast nook wall and adding square footage to the kitchen which allowed for the large appliances and increased storage that the client was seeking. What are some of the functional storage solutions you chose? We wanted to maximize storage to make sure nothing was under-utilized. We analyzed what each cabinet would be used for and what would be stored in it. We used Design Craft cabinets because the wall cabinets are 13” deep instead of 12”, which gave them extra plate and glass storage. We used tall wall cabinets which gave them an extra row of shelf space. We used the metal garage tambour for their small kitchen appliances. And, not only does the front and side of the island have storage, but the raised bar section does as well. We also employed roll-out trays in the pantry, pull out spice units, and vertical tray pull outs. Can you share some of the specific styles & finishes you chose? The client wanted a modern feel but also didn’t want to depart too drastically from the existing oak cabinetry used in their nearby spaces. So, we settled on quarter-sawn oak which has a nice textured look and tone to the oak elsewhere in the home, but has a decidedly more refined and modern-yet-classic look. The travertine floor ties into what’s used throughout their home. 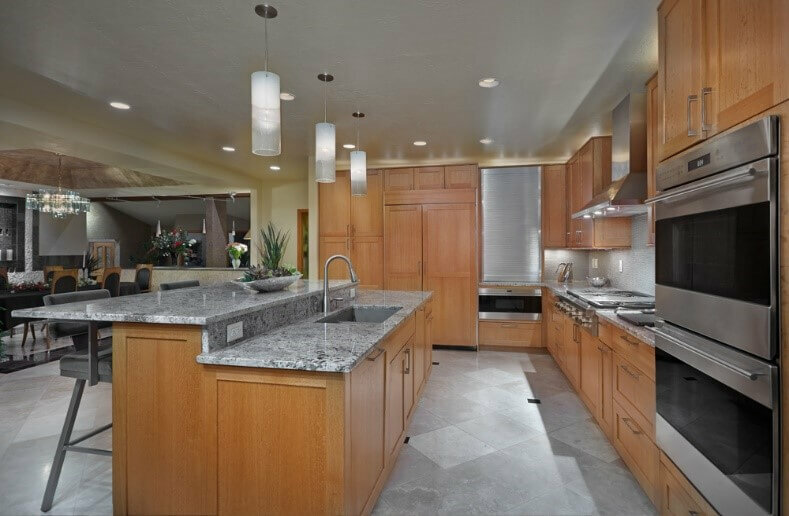 Natural granite countertops further adds interest and warmth to the space. The full height tile backsplash behind the chimney hood gives a nice focal point to the room. Any advice for homeowners who are just getting started? I think it helps to use a professional who can help guide you through the process of a kitchen remodel. 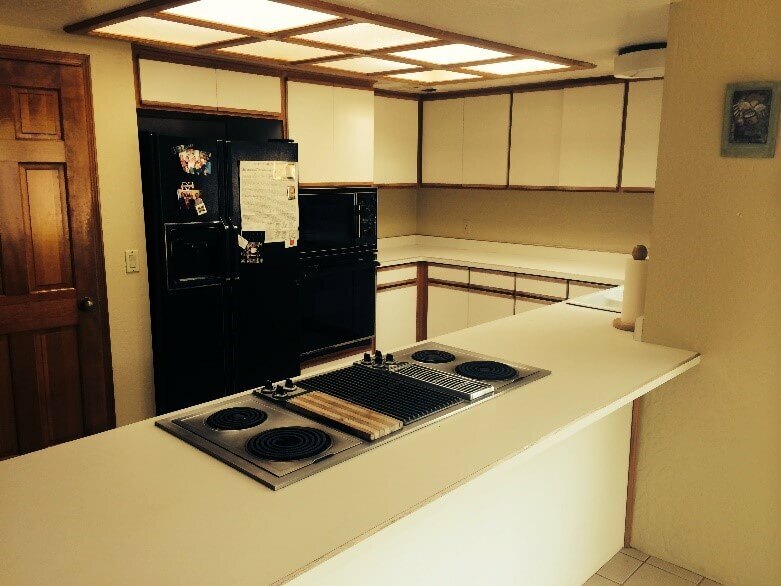 Although this remodel was extensive, not all kitchens need or warrant such a dramatic change. A professional can help you identify and create a plan that works for you, your home, your budget and your style. Remodeling and designing spaces is what we do every day, and our years of experience and expertise can help you maximize efficiency and storage as well as your budget so that you, too, can have your dream kitchen!